Clients who take everything personally, including perceived criticism, can suffer from a range of conflicting emotions, including lowered self-esteem, over-sensitivity, mood swings and stress. Often, other peoples' comments aren't even directed towards them, perhaps the person in question has simply had a bad day or is naturally tactless. Handling constructive criticism is something that we should all feel comfortable with. However, if your client is over-sensitive then they will need a strategy to help them to deal with this issue. 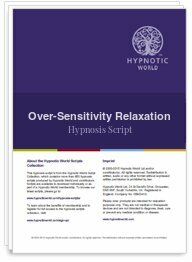 As a Hypnotherapist you can help your clients with this Over Sensitivity hypnosis script, to put things into perspective and overcome the issue of taking everything to heart.